A London family takes a modest house in the country for the summer, and the five children discover a sand fairy with the power to grant wishes. Cyril, Anthea, Robert, and Jane, and their two-year-old brother whom they call the Lamb, also discover that wishes aren't always all they're cracked up to be. What could be more harmless than Jane's wish that they all be "as beautiful as the day"? How could wishing for untold wealth--in gold coins--go wrong? Yet over the course of the summer, the children find that more often than not they are figuring out how to get through to sunset, when the sand fairy's gifts go away. This was a cherished favorite when I was a child, and it's still a lovely, wonderful book to read and reread. 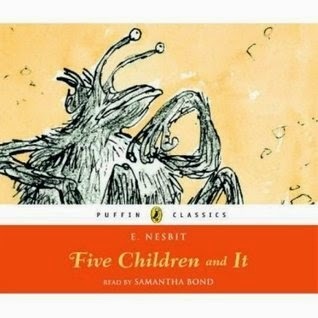 It ages very well; Nesbit's girls and boys are equally brave, clever, and loyal, with the impulsivity and unreliable judgment of real children.